Rome’s piazzas are famous for their dazzling arrays of fine cuisine, spectacular fountains, ancient architecture and enticing atmospheres. Even in the modern era, Rome’s piazzas are the centre of daily life. Want to see the best Rome has to offer? Make sure you visit these 7 amazing piazzas. 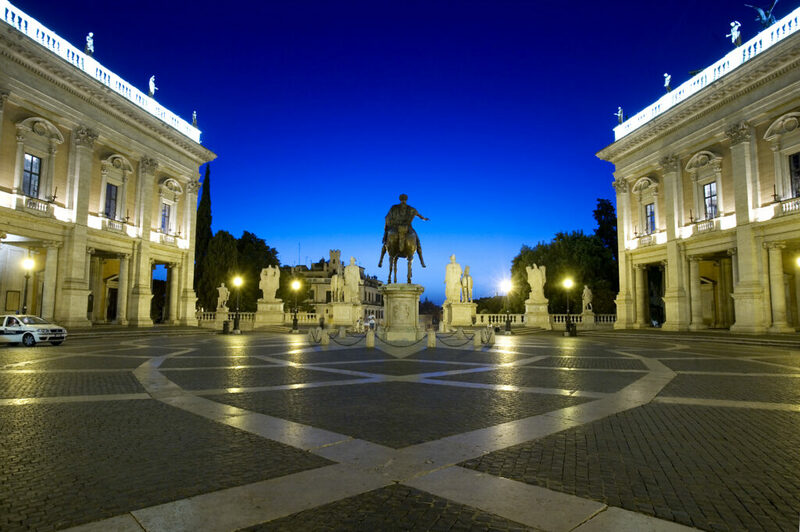 Piazza del Campidoglio is a work of art in itself – as it was designed by Michelangelo, we wouldn’t expect any less! The geometric design of the piazza faces St Peter’s Basilica – which was the political centre of Rome in Michelangelo’s time. Sadly, the piazza took so long to build and complete Michelangelo never got to see his work finished. Attracting millions of visitors each year, this piazza is one of the most beautiful squares to visit within Rome. 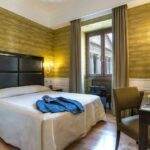 Situated on Capitoline Hill, the piazza is right next to the ever-popular Capitoline Museums, the Palazzo Nuovo and the Palazzo Senatorio. The most striking artefact on the piazza is the full-size bronze replica of the Marcus Aurelius statue (now safely on display in Capitoline Museums). 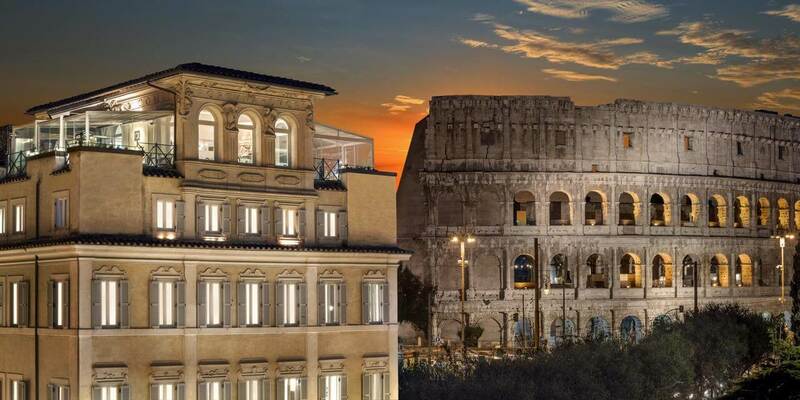 If you walk up the sweeping staircase and head towards the balcony at the rear of the piazza, you’ll be rewarded with an unrivalled view across the Roman Forum to the Colosseum. Right next to Basilica di San Pietro, St Peter’s Square features two beautiful colonnades by Bernini. One of the world’s most famous (and most photographed!) squares, this piazza is used by visitors to get a good view of the Pope when he is addressing his followers. The piazza was designed to fit as many people in as possible for the Pope’s appearances. In addition to Bernini’s designs for the colonnades and the stunning granite fountain, there’s an ancient Egyptian obelisk decorating the square. Originally standing at Heliopolis in Egypt, it was moved to its current position in 1586. The best time to visit? Early evening – the tourists have left, and the piazza is beautifully illuminated with a warm light. 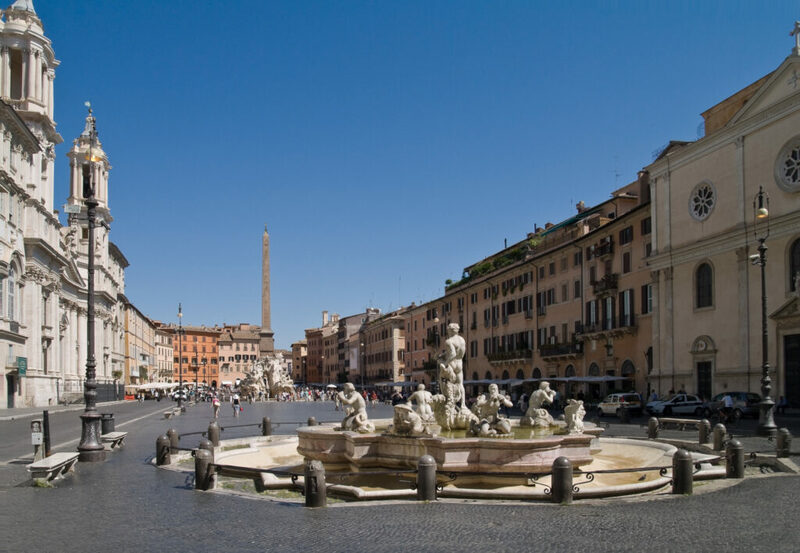 Home to one of Bernini’s most famous masterpieces, Piazza Navona is in a class of its own. The Fontana dei Quattro Fiumi (or the Fountain of the Four Rivers) features Bernini’s personifications of the major rivers of the four continents under papal control at the time: the Ganges (Asia), the Danube (Europe), the Nile (Africa) and the Río de la Plata (America). It was designed in 1651 for Pope Innocent X whose family palace, the Palazzo Pamphili, faced onto the piazza. The fountain also features the Pamphili family emblem. The piazza gets its distinctive oval shape from the ruins of an ancient circus, still present underneath its foundations. As with Piazza San Pietro, this piazza is best visited in the evening time to truly appreciate the beautiful palazzi and fountains, perfectly lit to showcase their full splendour. Campo de’ Fiori is the only piazza in Rome without a church. What it lacks in places of worship, it makes up for in Rome’s oldest and most colourful market. The Campo de’ Fiori market is an absolute must and is open Mon-Sat, 7am-1:30pm every week. Popular with tourists and locals alike, you can purchase fresh produce, cute trinkets and handmade crafts here. Looking at this gorgeous square now, you’d have no clue that the original use for the site was a public execution area! Keep an eye out – there’s a statue dedicated to the square’s ominous past, showing Giordano Bruno, the heretic who was subsequently burned at the stake in 1600. Bruno was originally a Dominican Monk and known for his philosophical works. His bronze statue sits on the exact place of his execution – deliberately facing the Vatican. 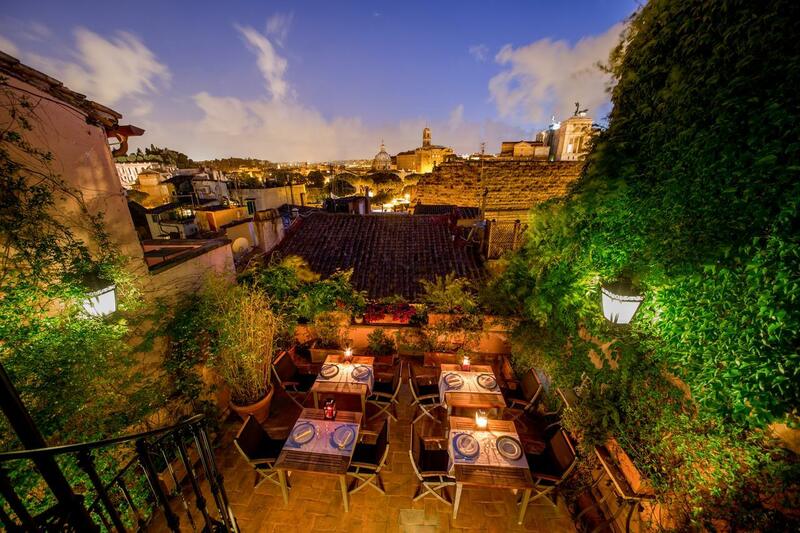 Nowadays, Campo de’ Fiori is a bustling nightspot full of trendy bars and popular eateries. There’s something for everyone! The most iconic piazza on this list, Piazza di Spagna is probably the most popular square for new visitors to Rome. Our favourite thing to do here? Grab some gelato, sit on the Spanish Steps and watch the world go by. Looking for some high-end shopping? The piazza is lined with designer stores and exclusive boutiques – just don’t expect to grab a bargain! Want to enjoy the sights but avoid the crowds? Try and get to the piazza early in the morning before the usual crowds arrive. If you don’t mind sharing the sights with other tourists, we highly recommend getting to the top of the Spanish Steps for sundown. 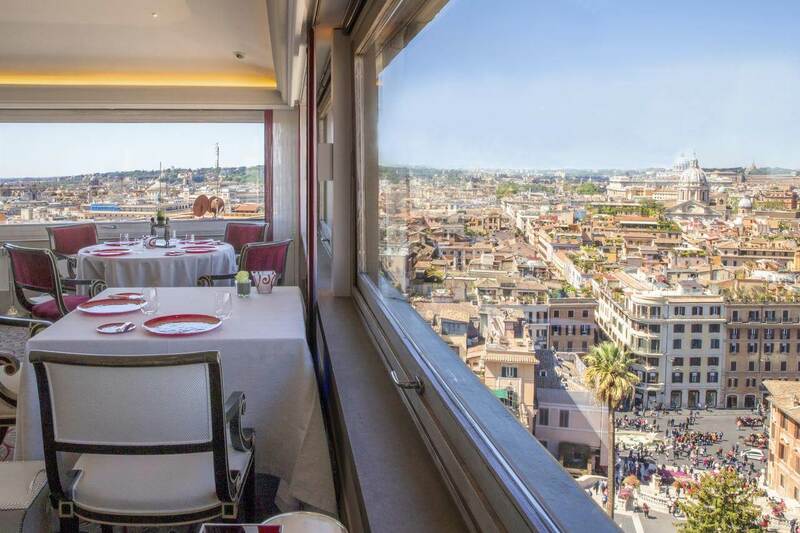 The views over Rome are simply breath-taking. Cross the Tiber River to get to this picturesque spot. We love stopping off here for a spot of lunch – the daytime sees Piazza di Santa Maria take on a very chilled out vibe with a friendly atmosphere. 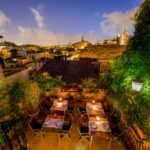 For something more lively, pass by in the evening and rub shoulders with locals enjoying an Aperitivo and visitors-in-the-know sampling some of the best food Rome has to offer. There’s plenty of free entertainment too – the square comes alive with street musicians and artists after hours. Last, but definitely not least, on our list is the majestic Piazza della Rotunda. 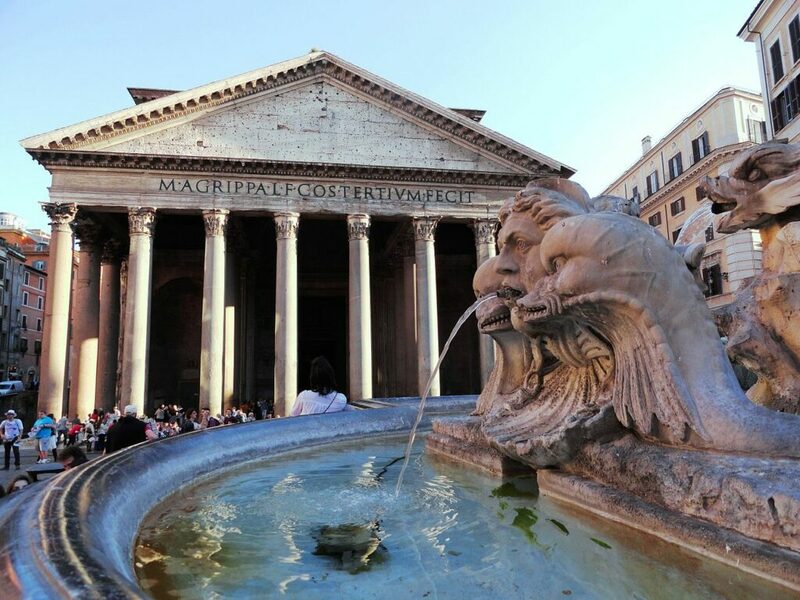 Bordered by the awe-inspiring Pantheon, this piazza is the perfect place to take in Rome’s amazing ancient architecture. As it’s so popular with tourists, avoid the overpriced restaurants and just take in the wonderful ambience! If you’d like to learn the fascinating history surrounding these stunning piazzas, consider booking in for our most popular tour: Rome In A Day Private Tour. 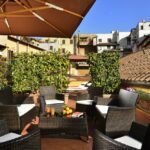 Choosing where to stay in Rome can be a headache in itself – with 22 very different districts (rioni) to pick from, it can be tricky choosing where’s best for you and your needs. Every district has a different price range and it’s own unique atmosphere. 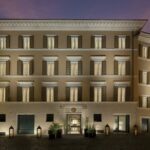 Rome, as always, has something to suit everyone – and everyone has a different idea of what the ‘best hotel in Rome’ is! 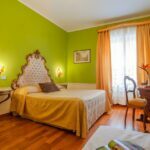 So, the team here at Real Rome Tours have written this helpful guide to the best accommodation in Rome, based on our years of experience in the Eternal City and our customers’ recommendations. 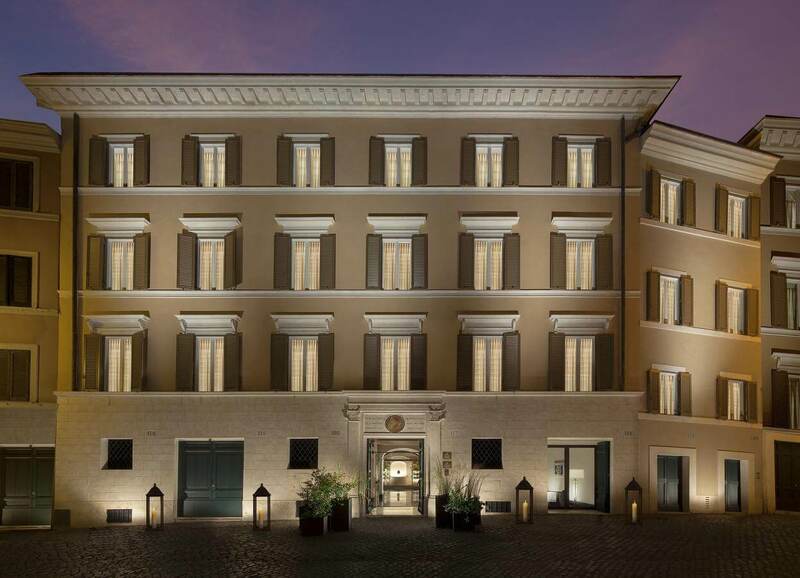 The historic centre of Rome is perfect if you want to leave your hotel’s front door and be immersed in Rome’s most popular sights. There are two compromises for the convenience of everything being within walking distance: crowds and cost. 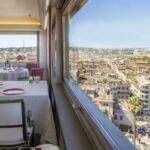 As it’s one of the most popular sections of Rome, staying (and eating) in the city centre can be more expensive than some of the quieter districts on this list. 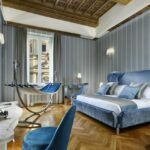 Get a taste for the luxuries of modern Rome while staying amongst the ruins of Ancient Rome in this gorgeously stylish hotel. 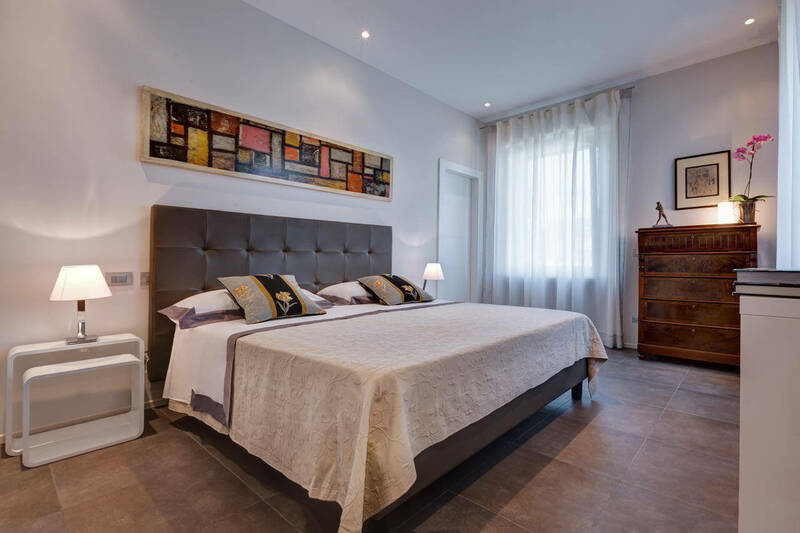 All apartments are air-conditioned and come with a welcome basket, a free bottle of Castello delle Regine wine and tranquil landscaped gardens to enjoy. Tired from a hard day of sight-seeing? 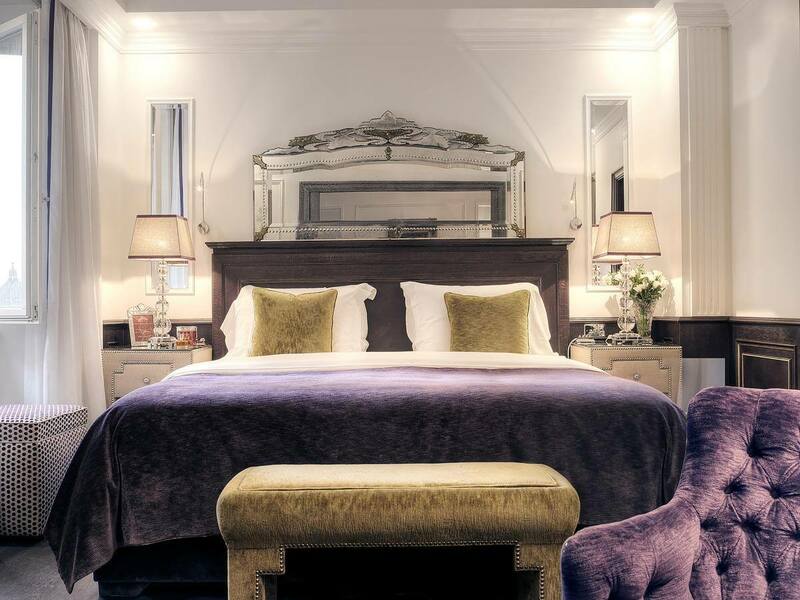 Each room comes with free Wi-Fi, flat screen TV and a tablet. The Colosseum is just a 15-minute drive away and buses to see the rest of Rome’s treasures stop right in front of the hotel. When your vacation is over, there’s even a free shuttle bus to the airport – what more could you ask for? 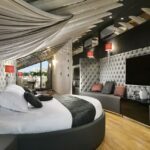 Check out this amazing hotel here. This 5* hotel is simply legendary. 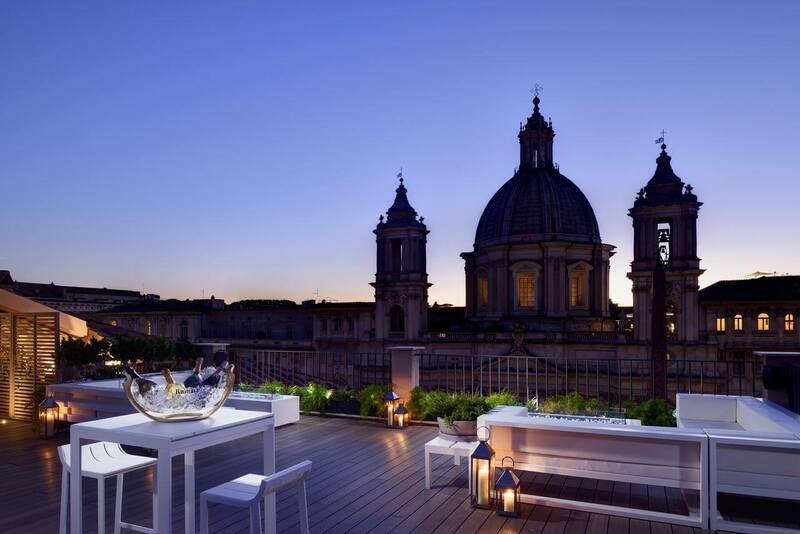 Right at the top of the Spanish Steps, this hotel has unbeatable views over Rome’s rooftops. 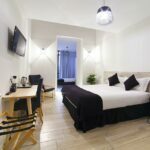 It’s rooms are elegant and stylish with free WiFi, satellite TV, air conditioning, DVD player and a smartphone to call home. The rest of the hotel boasts a free gym, sauna and Turkish bath. Feeling peckish? 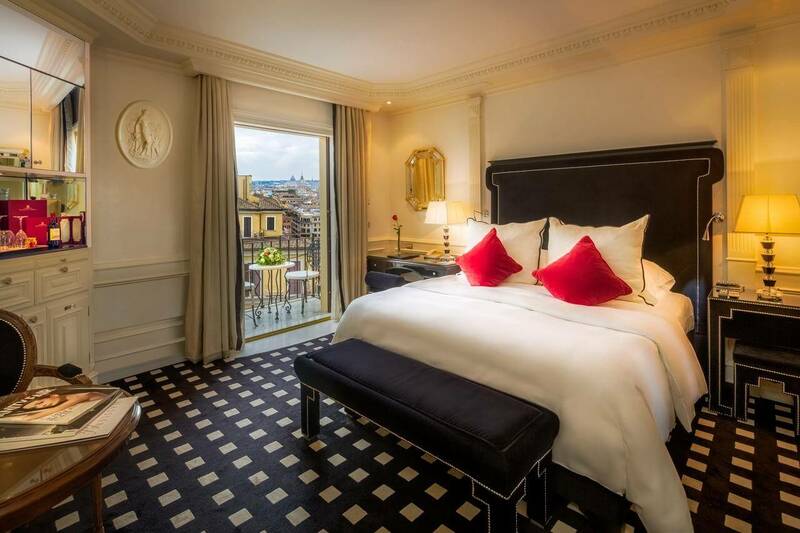 You can choose from Michelin-starred Imàgo, super stylish Salone Eva or the impressive Palm Court. You can book in here. 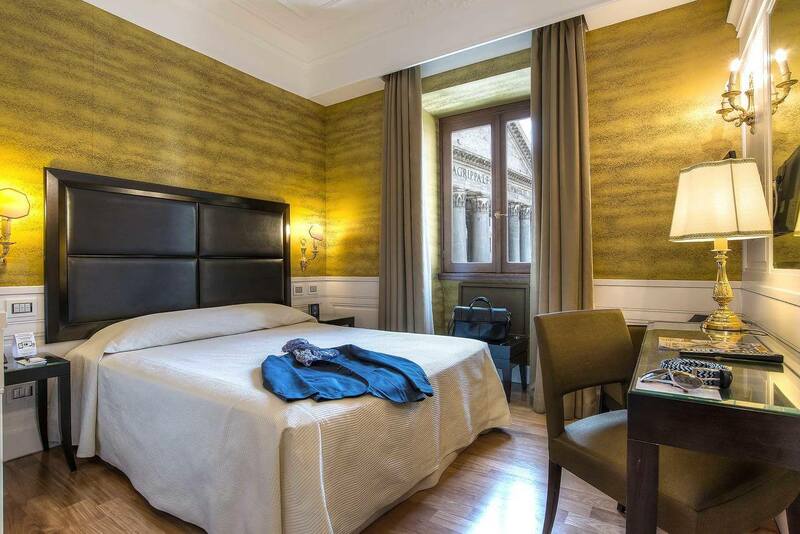 Nestled away on a side alley beside the Trevi Fountain is this fifteenth century palace. Once home to an Albanian prince, the palace now offers international explorers a taste of the good life in pure luxury. 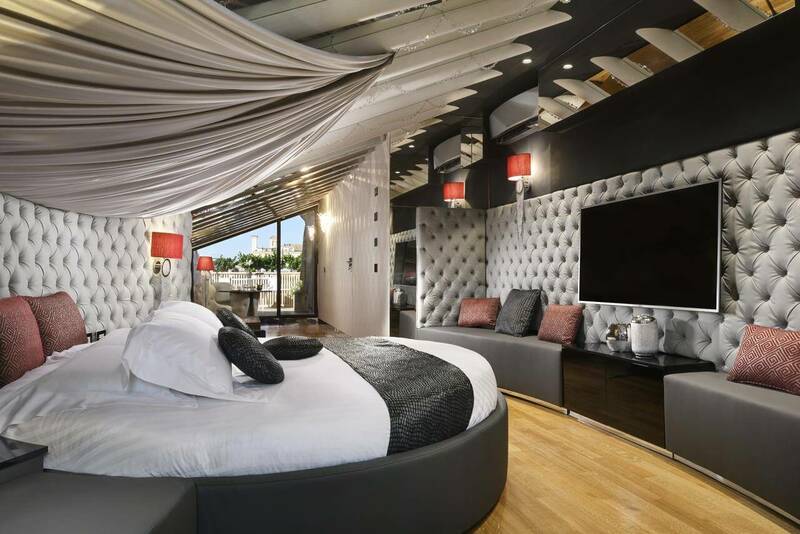 Incredibly popular with couples, each room/apartment has the option to add a personal butler to serve your every whim! Check it out here. 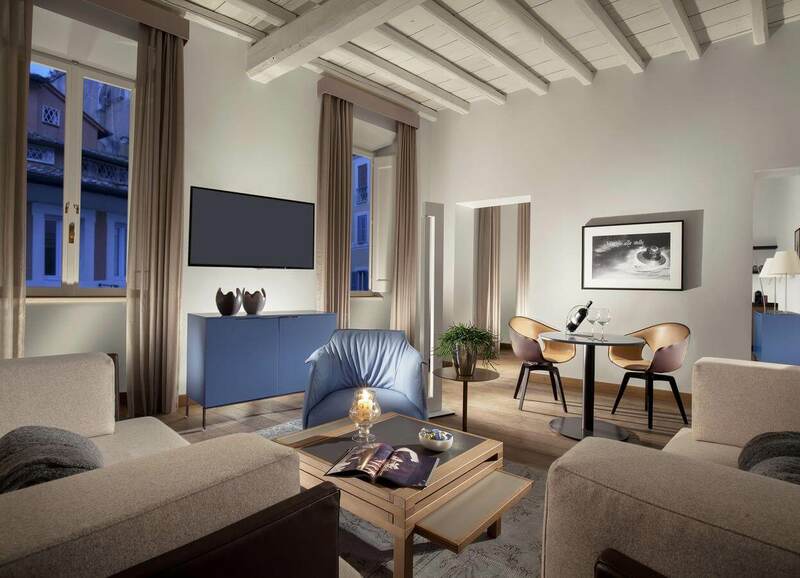 Built in 1440 and originally a noble palace, Lifestyle Suites Rome is an adult only destination designed with opulence and ultimate comfort in mind. 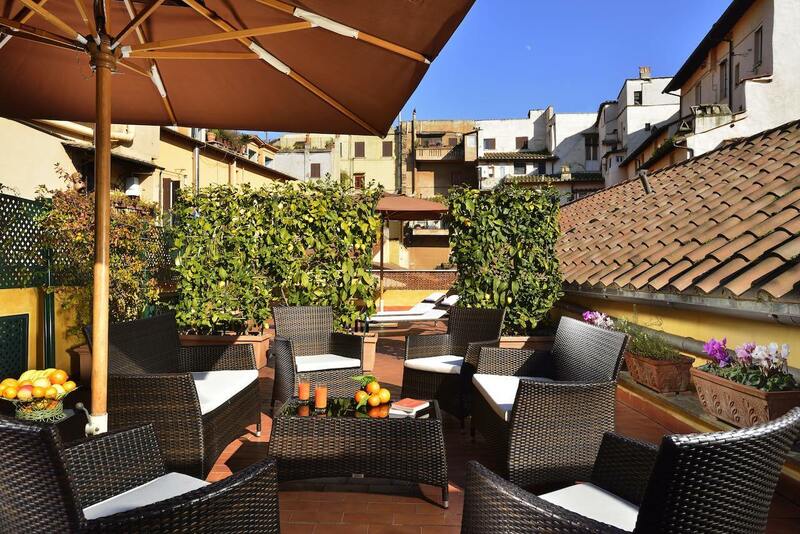 Take in the breathtaking views over Piazza Navona from the terrace or take a stroll to the Pantheon (a five minute walk away). 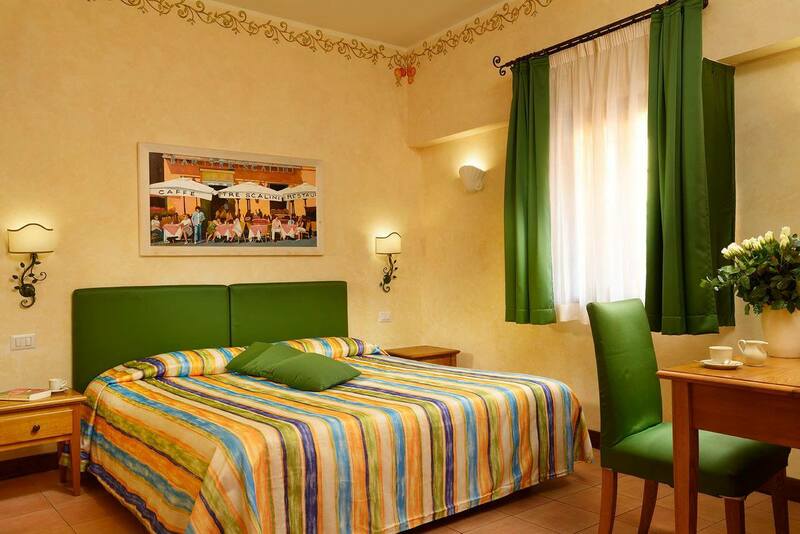 All rooms are air-conditioned and have free WiFi, mini-bar and satellite flat-screen TV. 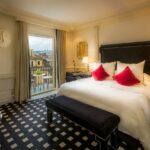 Book early and request a room with a balcony facing the square and enjoy the bustle of Rome from the comfort of your own space. See full details here. 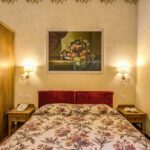 Airbnb rentals are incredibly popular in Rome and standards are usually incredibly high across the city. 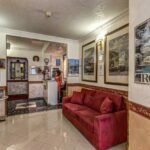 Here are our choices for the best Airbnb properties in the historic centre of Rome. Make sure you see the best of Rome's historic city centre with our Heart of Rome tour. A firm favourite in the Real Rome Tours office, Travestere is like visiting a welcoming little country town – just in the middle of Rome! 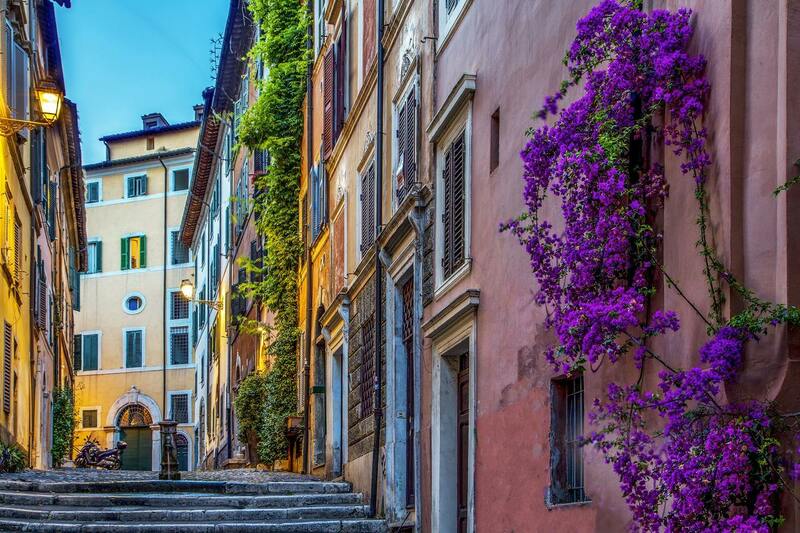 Picturesque cobbled streets are lined with the finest authentic restaurants Rome has to offer. 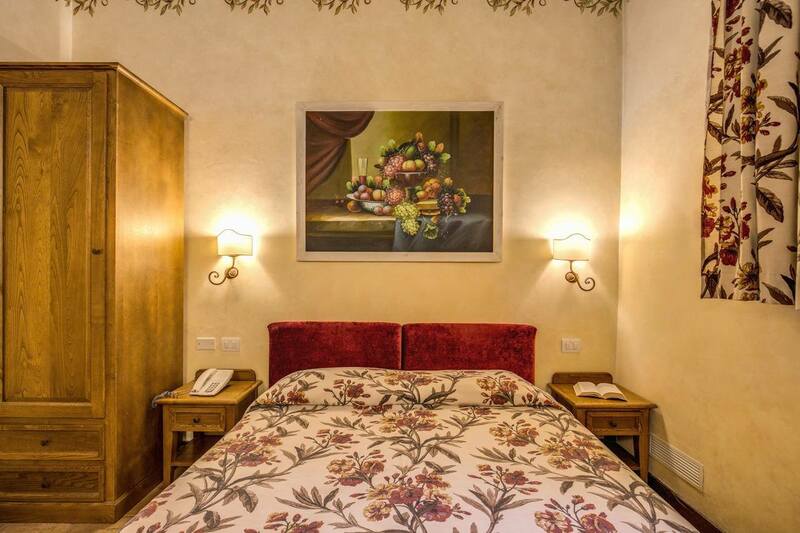 Staying here gives you easy access to the Campo de’ Fiori market, Piazza Farnese, the Teatro Marcello and the Bocca della Verità (the Mouth of Truth). 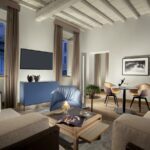 Travestere is perfect for those looking to stay centrally but skip the large crowds associated with the historical city centre. Oh and did we mention the amazing food on offer here? 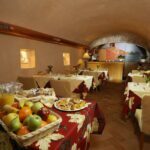 You have more dining choices available for a more affordable budget than in other areas of Rome. 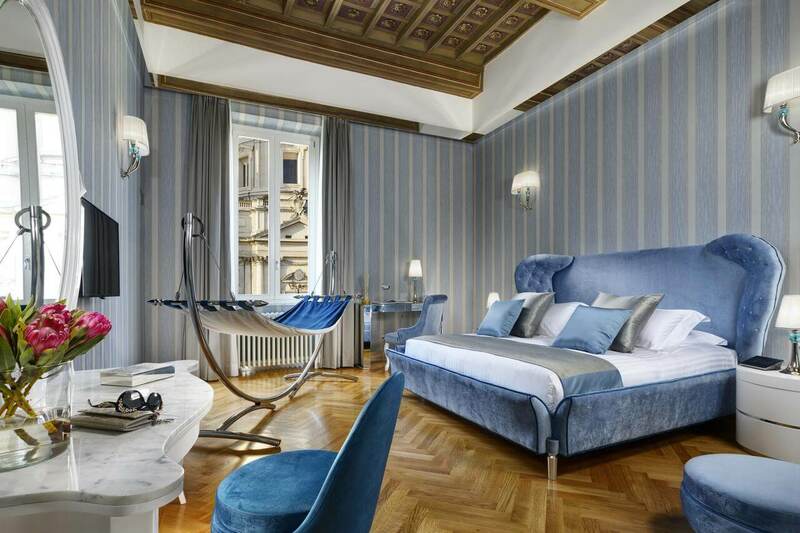 Just 600 metres from Saint Peter’s Square and the Vatican City, Sotto La Cupola offers guest rooms that are spacious and elegantly decorated with antique-style furnishings and parquet floors. 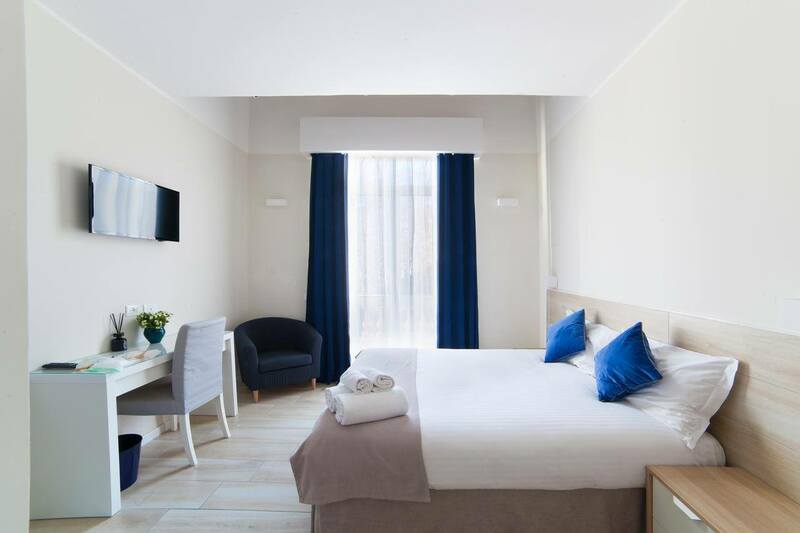 Each room features free wi-fi, a flat-screen TV, a hairdryer and free toiletries. An Italian breakfast is served daily in the common room is absolutely delicious. 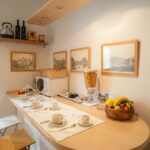 Helpful for those travelling with specific dietary requirements, guests can prepare their own meals in the shared kitchen. 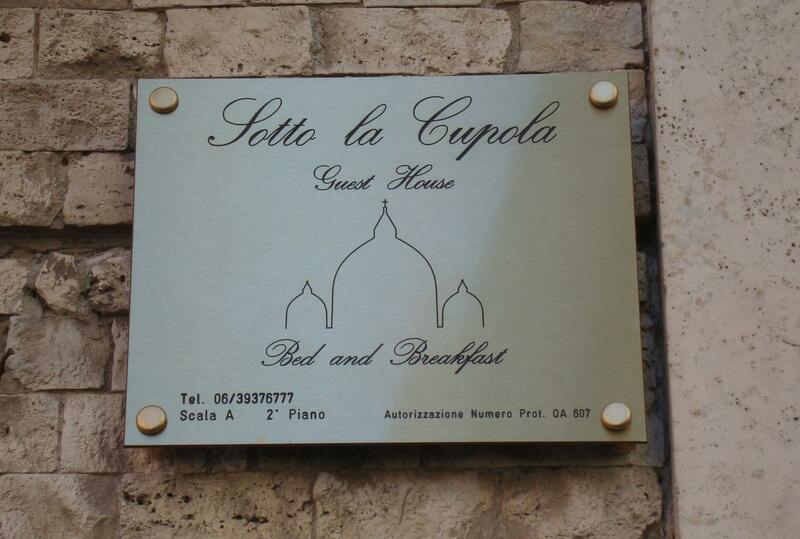 Sotto La Cupola is 350 metres from Roma San Pietro Train Station. 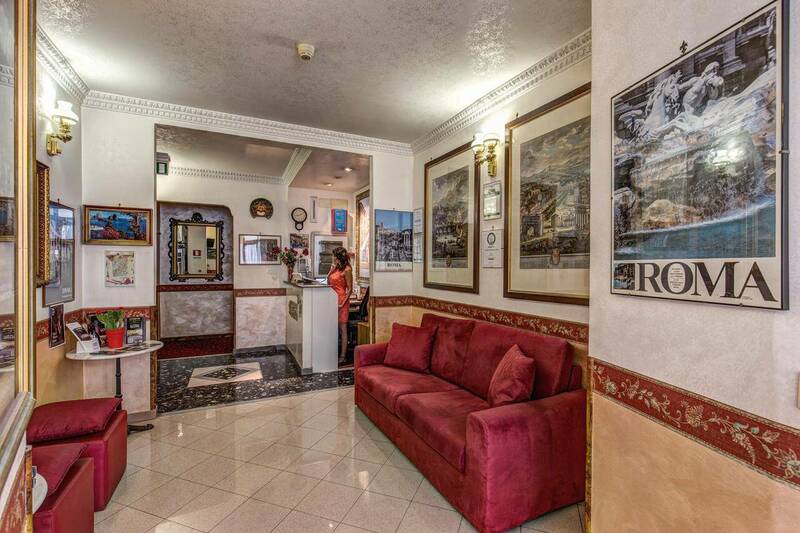 A bus, with links to the Colosseum and Rome’s historic center, stops 50 metres from the property. There’s also a free private airport shuttle available. Get more details here. 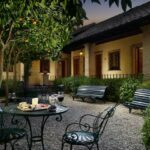 Quietly stylish, Hotel Santa Maria is housed in a converted 16th-century convent. 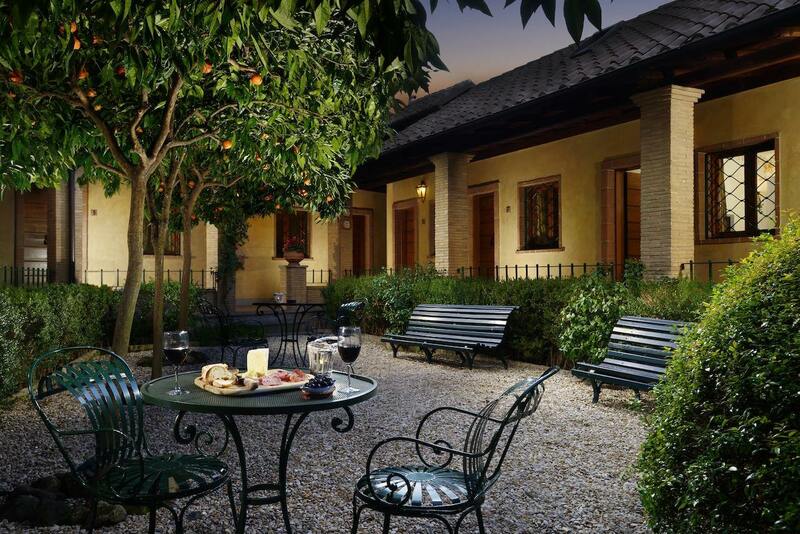 Wake up to gorgeous views of the hotel’s landscaped grounds full of fragrant orange trees and Mediterranean flowers. 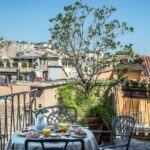 You can even enjoy your breakfast on the grounds and soak up the famous Roman summer sun. 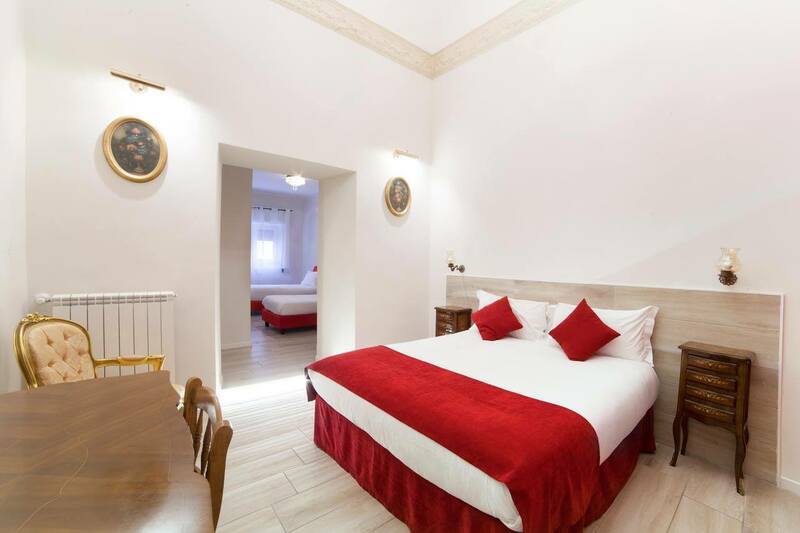 The perfect mix of modern and traditional, each guest room features terracotta floors, elegant wood furniture, air conditioning, an LCD satellite TV and free Wi-Fi. Get all the info here. 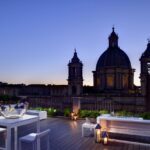 This is one of the most popular places to stay in the whole of Rome on Booking.com! 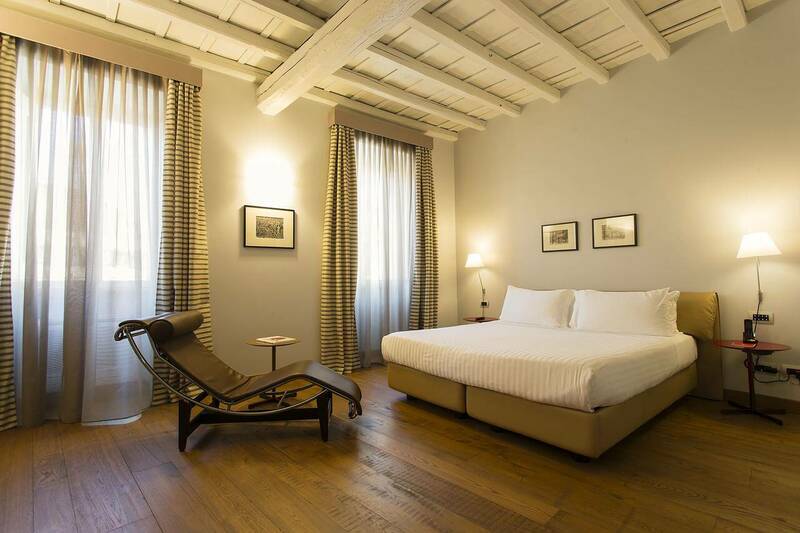 Set in a renovated historical building, you can choose between a room or an apartment. 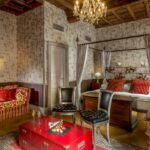 We absolutely love the traditional decor of this hotel – it’s like staying in a gorgeous countryside villa – but in the middle of Rome! 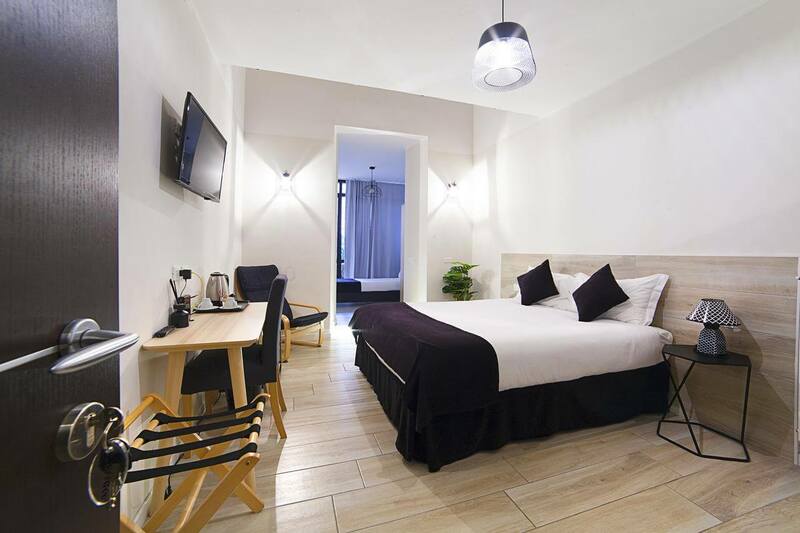 Each guest rooms is completed with wooden furniture, wood-beamed ceilings, an LCD TV and free Wi-Fi access. Breakfast is a must – a generous sweet and savory buffet breakfast – all served in an antique cellar restored into an elegant dining room. Find out more. 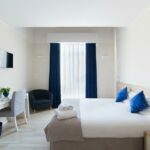 There’s not a huge amount to see within walking distance around Termini station, but staying here gives you so many inexpensive accommodation choices. You can easily access the big tourist spots via train, taxi or metro. The district around Termini Station is called Esquilino and is Rome’s unofficial immigrant district. It’s relatively chilled out and safe and is home to food delicacies from all over the world. 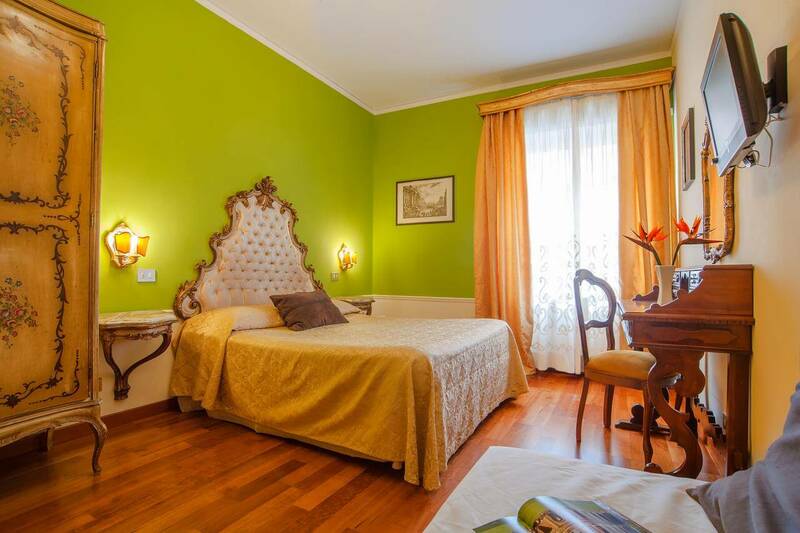 A family-run B&B, Hotel Giuliana is just a 7-minute walk to Termini station. 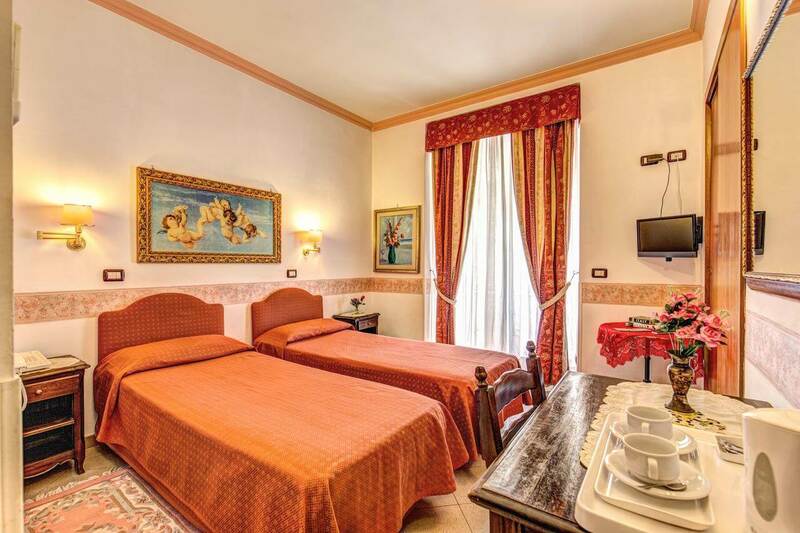 Classically decorated, each room has air conditioning and a private bathroom. The public areas of the hotel are relaxed and welcoming. The staff here are very helpful and friendly and can recommend the best places to eat in the area. Check out full details here. 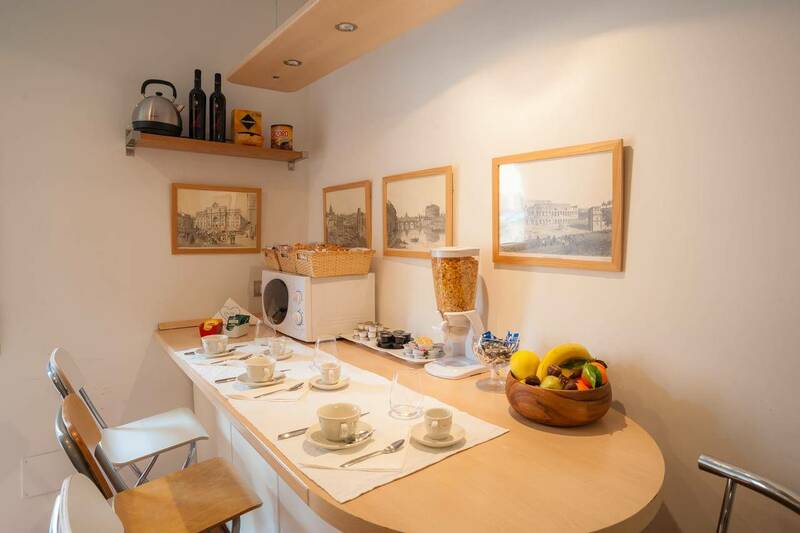 A simple, modern stylish guest house within walking distance of Santa Maria Maggiore and Domus Aurea. Breakfast is served each morning and includes gluten-free options. The guest rooms all come with a toaster, fridge, coffee machine, free toiletries and tea-making facilities. Check in here. Traditionally a residential neighbourhood, Celio is built around the Colosseum. 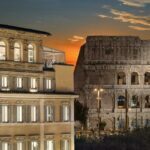 During the day, this area of Rome can get very chaotic – but once the sun’s gone down, prepare for beautiful views of Constantine’s Arch and the Circus Maximus. Perfect for lovers of ancient Rome, Celio gives you a taste of suburban Rome. Simply amazing views. The views alone would make us stay in this hotel! 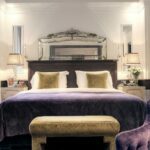 But there’s plenty more on offer here, the location is perfect for exploring, the service is perfect and the hotel is very child friendly. See more details here. 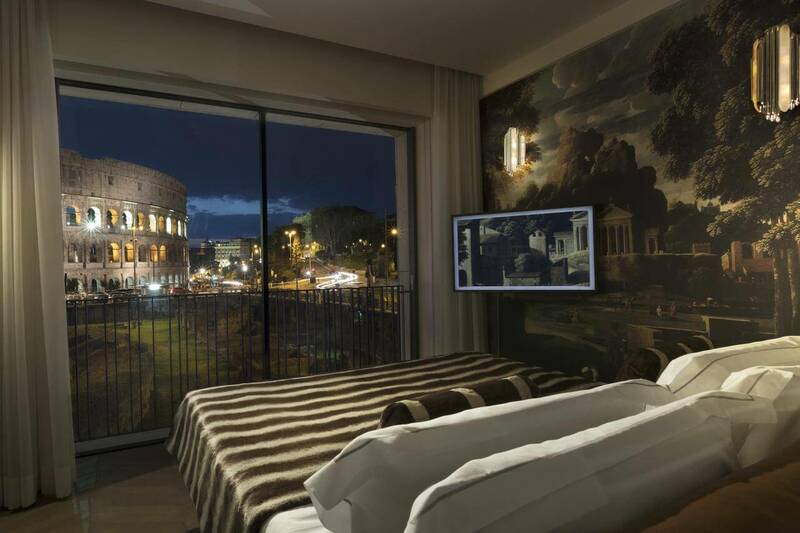 Pure luxury located in the heart of ancient Rome, The Inn at the Roman Forum actually houses ruins inside the property. 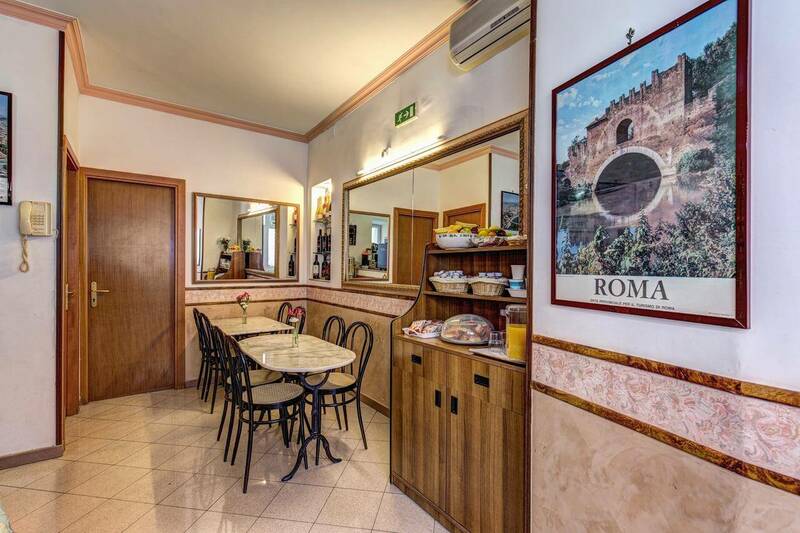 The Inn thinks of everything a visitor to Rome could possible want and serves it to you with a smile. 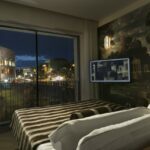 Rooms come with free WiFi, satellite flat-screen TV and an iPod docking station. 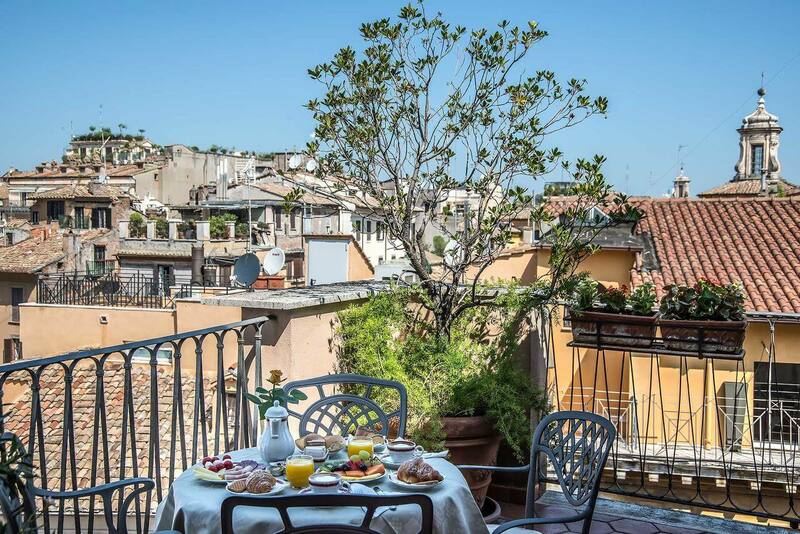 A rich breakfast buffet is served on the rooftop terrace with breathtaking views of Rome and is an absolute must while staying here. Book in here. 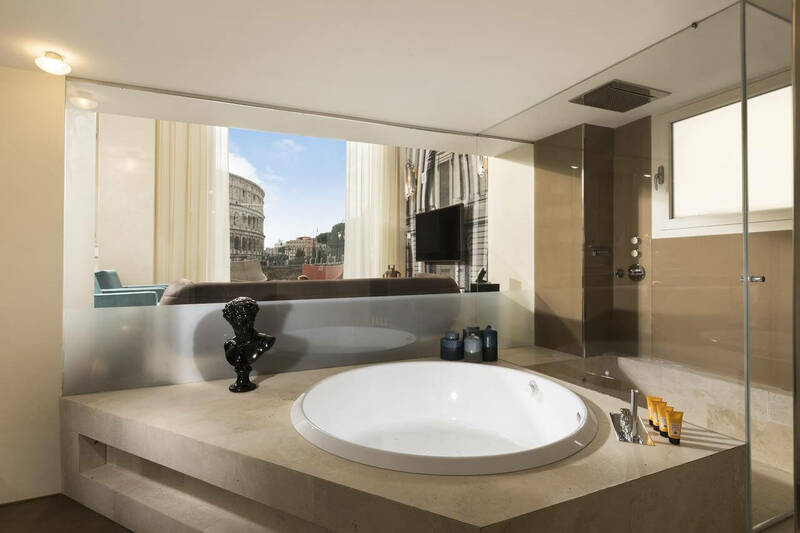 Unrivalled views of the Colosseum are combined with luxurious surroundings at the Hotel Palazzo Manfredi. 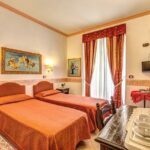 Rooms here are spacious, offer free Wi-Fi and Sky satellite TV and have a view of the ancient ruins along the Roman Forum. You can also opt for a self-catering option. If you really want to see Rome in style, you can rent a Lamborghini from the front desk! Check out this amazing hotel here. Looking to fall in love with Rome all over again? Maybe you’re visiting soon and want a taste of what to expect. Luckily for you, writers have been infatuated with the Eternal City for centuries. 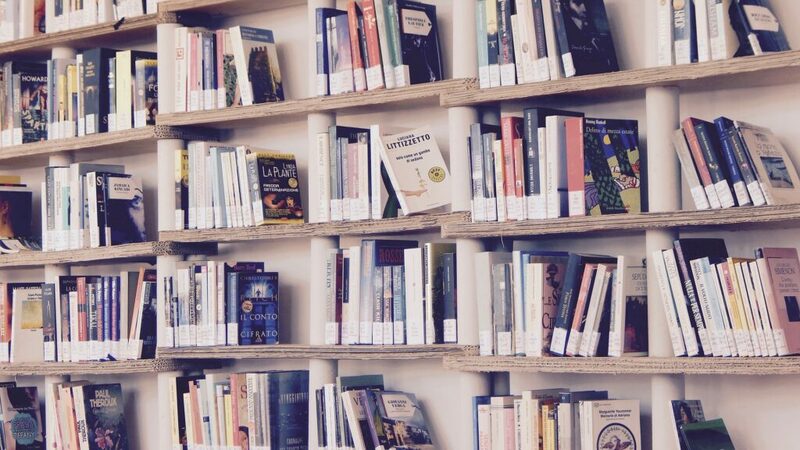 We’ve picked out some of our favorite books about Rome to get you in the mood for the unique blend of history, romance, intrigue and vibrant culture that Rome has to offer. Going back to ancient Rome, this classic is widely considered one of the best novels of the 20th century. Graves writes as Roman Emperor Claudius. Covering Rome’s imperial history up until Claudius’ coronation in 41AD, I, Claudius paints a vivid picture of what ancient Rome was like under the rule of Augustus, Tiberius and Caligula. 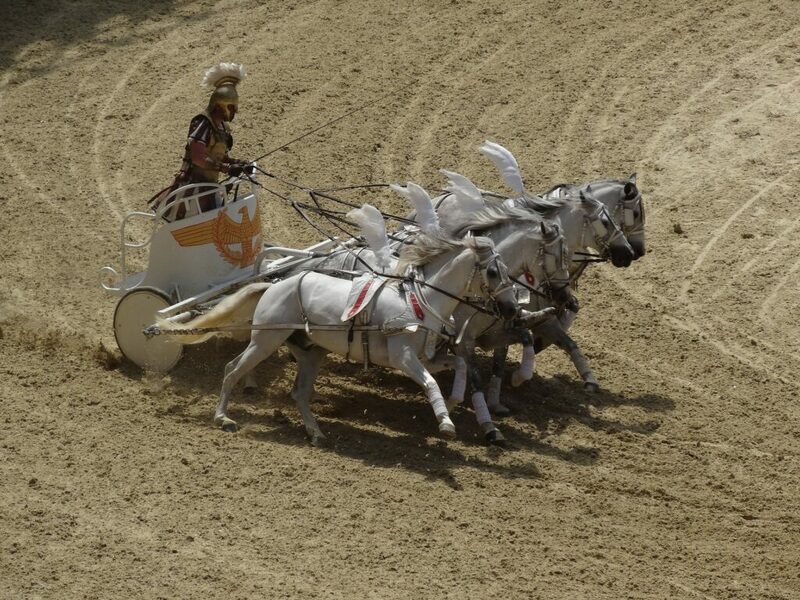 Experience what ancient Rome was really like with our Ancient Rome Tour. Published in 1939, this is an award-winning, factually-accurate novel about Lucrezia Borgia. Borgia certainly lives up to her family’s reputation for controversy and cruelty, but Bellonci also highlights Lucrezia’s more complex, human side in this riveting book. This short memoir by Pulitzer-Prize-winner Doerr chronicles his year-long stay in Rome for his fellowship at the American Academy. This is a great introduction to what modern life in Rome is actually like. There’s something for everyone in this collection of 20 short stories from Italy’s finest literary figures. Spanning hundreds of years, the Eternal City’s many faces are showcased in a combination of comic, tragic and dramatic tales. With such a wide variety of genres and time periods covered, this lovely little book is surprisingly easy to read. A fantastic introduction to Rome, the locals and Roman culture. One of the masterpieces of modern Italian literature! The multiple layers of language, imagery and irony lead this author’s work to be compared with James Joyce. Gadda draws together different strands of Roman life in a detective story that focuses on the elusiveness of truth. The plot revolves around Detective Ingravallo’s investigation into a robbery and murder in an apartment building on the Via Merulana. Set during the fascist regime, this novel transports you back to a dark period of Rome’s modern history. Set within an apartment building in Piazza Vittorio, Lakhous’ novel is created from the testimonies of the building’s inhabitants surrounding the death of a sinister character in the elevator. Despite the plot, this book is a delicately written comedy. Lakhous paints an affectionate picture of modern Rome featuring modern Romans – ‘Romans’ from across the globe. Explore the real, multi-cultural Rome on our Travestere and Jewish Ghetto Tour. 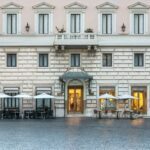 Wondering what to do in Rome with kids? Traveling with kids in Rome can be daunting – how do you keep young children’s attention but still keep teenagers happy and enthusiastic? It can be difficult finding age-appropriate sites to visit – there’s nothing worse than trying to keep a screaming two-year-old quiet in the usually-silent Vatican museums! But Rome has something for everyone, young and young-at-heart alike. Here’s a list of our 10 favorite family-friendly things to do in Rome. History comes alive on Rome’s cobbled streets and a visit to Rome is the perfect chance to get your little ones interested in the past. Two great options to visit are he Roman Forum and the Colosseum. They’re next to each and right in the middle of the city – so no complex transport arrangements are needed – making your visit as stress-free as possible. Kids of all ages love to go deep beneath the Colosseum’s arena floor and walk where the gladiators once walked. Underneath the Colosseum, there’s a maze of tunnels and the hypogeum (holding area). Animals held in this area included elephants, lions, leopards, bears and tigers! Great for younger children, the forum is an open area full of ancient ruins and stunning scenery. Many families love to take some time out of their sightseeing schedule to simply sit and enjoy their beautiful surroundings here. You can visit both the Forum and the Colosseum’s underground on our VIP Ancient Rome Colosseum Underground Tour. If they loved the Colosseum, this is a great follow up! There are a few companies in Rome that now offer gladiator classes and diplomas – complete with real-life gladiators to show them how it’s done. Run by historical re-enactors, kids get to dress up and learn authentic gladiator swordplay. Running at two hours long, gladiator schools are suitable for kids six years and over. The class starts at Gruppo Storico Romano museum to see real gladiator artifacts and to try on realistic armor replicas. The perfect place to unwind and relax, Rome’s parks are truly unique. 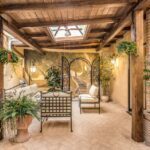 Many were originally owned by wealthy and powerful Roman families and still have the splendor and grandeur to prove it. 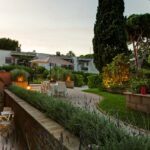 A lot of parks in Rome have restaurants, cafes, playgrounds and lakes to explore with your little ones – a perfect break from the sometimes-hectic inner city. 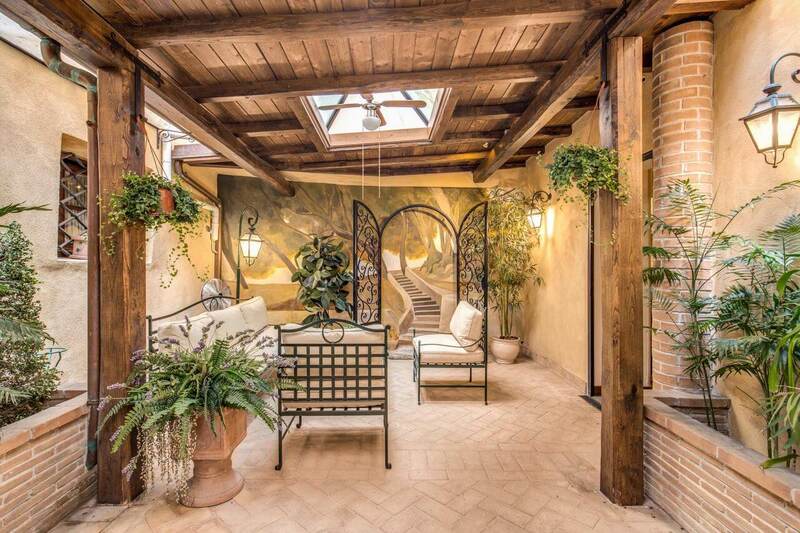 Once owned by the famous Borghese family, this oasis in the city is now open to the public. Incredibly popular (without being overcrowded), there’s plenty for kids to enjoy: pony rides, a zoo (with it’s own little train! ), a funfair and a number of playgrounds. A favorite with locals, the Borghese gardens offer you the chance to explore the lake by rowboat, see the entire park on bike and even rent a Segway. 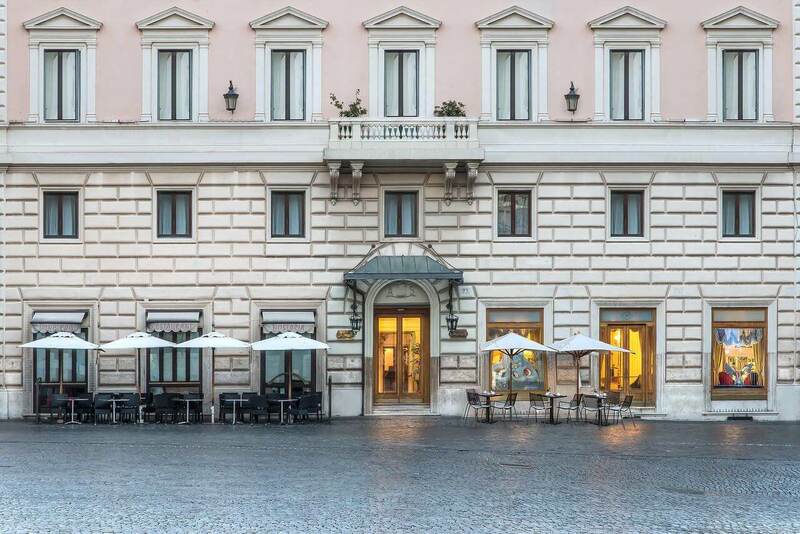 You can also visit the Gallery Borghese on-site, a wonderful collection of art and sculpture from the likes of Bernini, Caravaggio, Raphael, Canova and others. Book in for our private tour of the gallery and learn about the fascinating (and sometimes scandalous!) lives of the artists. 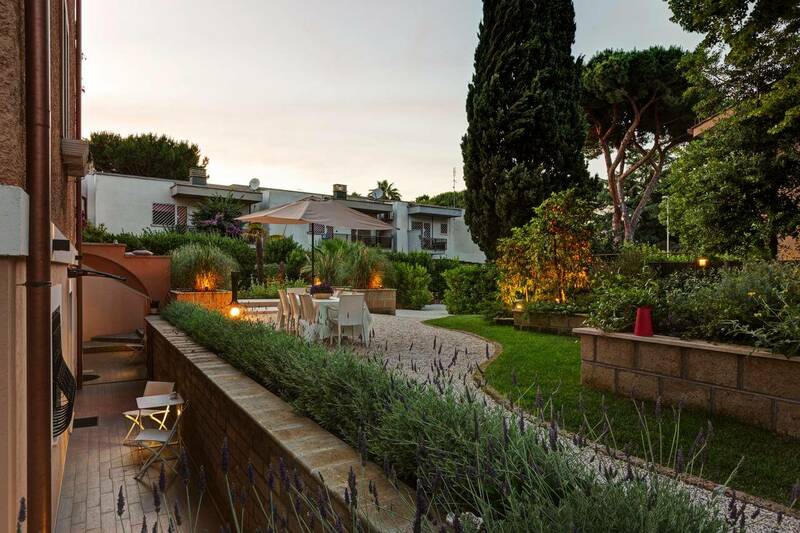 A beautiful little gated garden on top of Aventine Hill, the Orange Garden has spectacular views of the entire city. Filled with orange trees (hence the name! ), the Orange Garden was created in honor of St. Domenico who is said to have planted the first orange tree in the area in 1222. There are some things every visitor to Rome simply must do! Gelato is the most delicious ice cream you will ever taste. Combine everyone’s favorite food with a visit to one of the most iconic images of Rome – the Spanish Steps. The 138 historic steps are said to the widest in Europe and are an incredibly popular meeting place for tourists and locals alike. 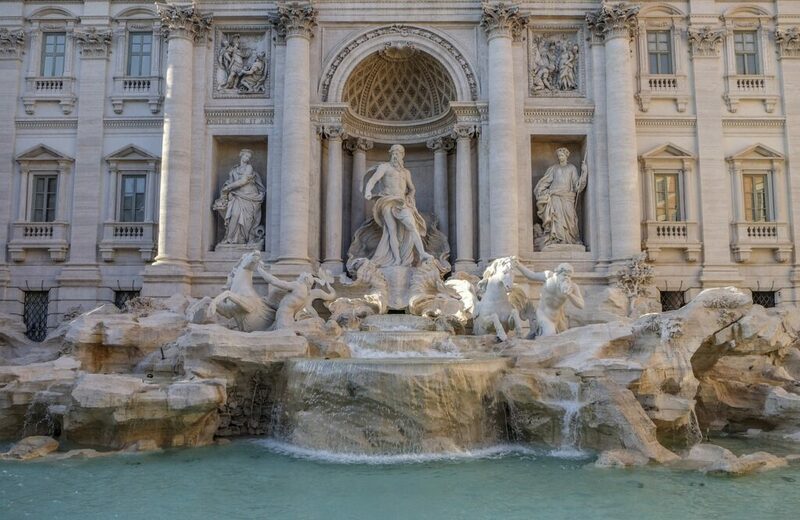 Seen on the big screen in many Hollywood classics, the Trevi Fountain is another iconic image of Rome. The story goes that when you throw a coin into the fountain, you’re destined to return to Rome. Kids love this tradition and the fountain collects around €3,000 a day! Where does all that cash go? It’s divided up and donated to local charities – so feel free to keep throwing your pennies in. 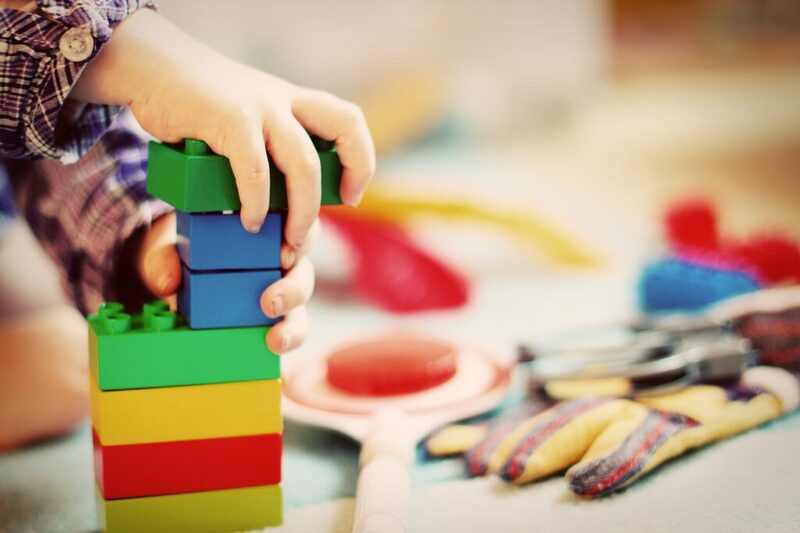 If you’re unlucky enough to get bad weather while you visit Rome, check out Explora – a museum dedicated to fun things for kids to do. Perfect for under-12s, there are a lot of interactive displays to enjoy including water features, role play areas and a life-sized model of Italy’s fastest train’s cab. Well, if they’ve behaved through all the sightseeing, why not! A local favorite is Bartolucci near the Pantheon – a traditional toy shop stocked with old-fashioned colorful wooden toys. Al Sogno is also a popular choice (it’s on Piazza Navona) – it’s best known for its wonderful and extravagant window displays. Only for the Older Kids! 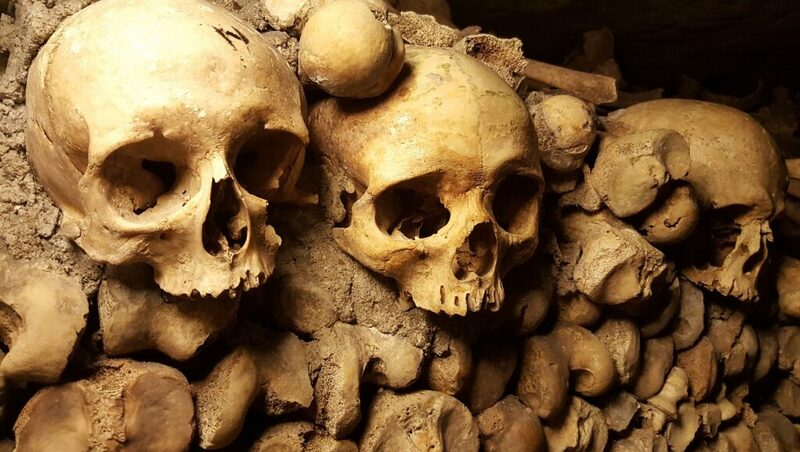 If your older children/teenagers are looking for something spooky, a visit to the Catacombs are a good choice – they’re dark, creepy and full of skeletons. The catacombs are hidden deep under modern Rome’s streets and are strictly by guided tour only. Originally used to bury the dead by early Christian settlers, there are thousands of bodies displayed along 300km of catacombs – including some saints, popes and martyrs. 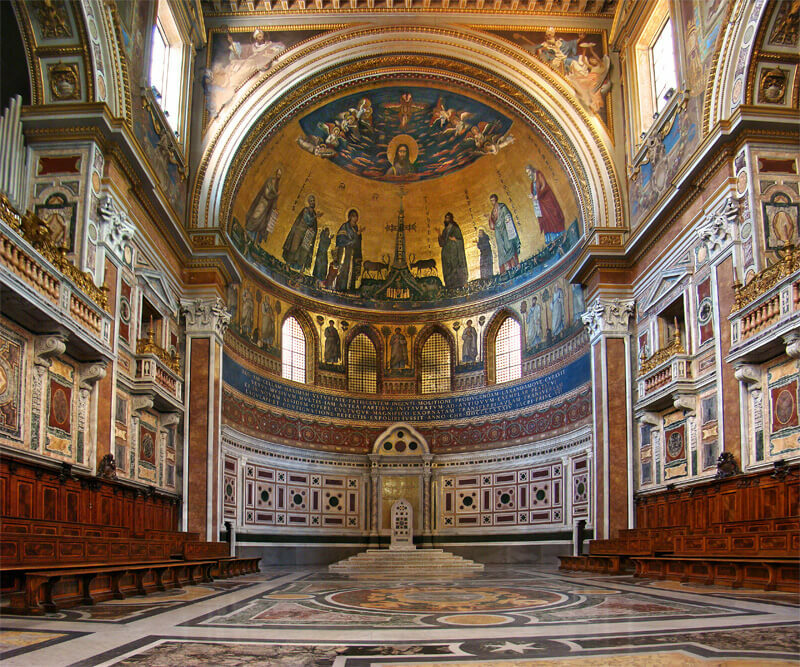 With over 600 churches, Rome is the perfect destination for lovers of holy art and architecture. You don’t need to be a Catholic to appreciate the breathtaking beauty and centuries of fascinating history housed within Rome’s holy sites. The tradition of visiting Rome’s stunning holy places dates back to 1552 and what can be argued to be the first package tour guide from Filippo Neri. The Italian priest’s circuit of the Seven Pilgrimage Churches of Rome attracted over 6,000 people each summer. Whether you’re looking to see some awe-inspiring art, worship during Holy Week or study the masters of Italian art – there’s something for everyone within our top holy sites in Rome. The good news? Many of the must-see holy places in Rome are easily accessible on foot. Many of them are within 10-20 blocks of each other! Want to hear the full history and insider information? 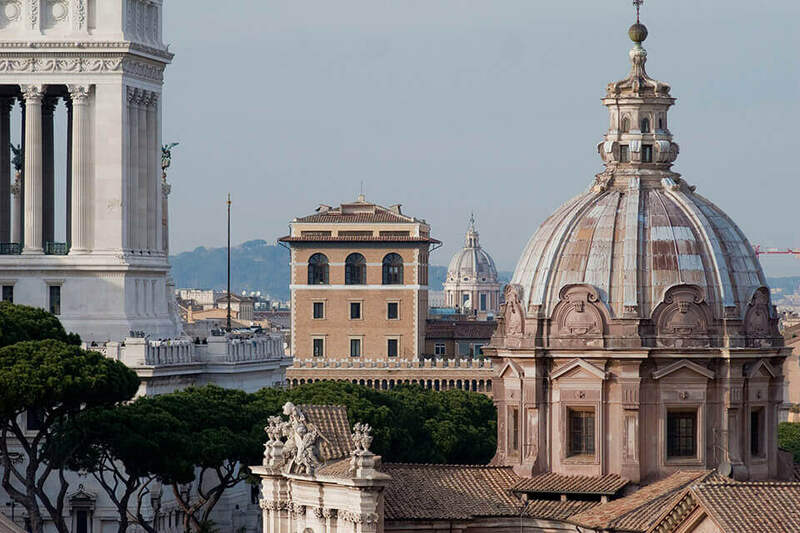 Check out this exclusive Basilicas of Rome tour. Well of course we have to include St Peter’s in this list! St Peter’s is the world’s largest (and most visited) church and features a striking key-shaped courtyard designed by Bernini. While you’re here, stand on one of the colored pave stones by the fountain and check out the optical illusion of many rows of columns disappearing into one single column. 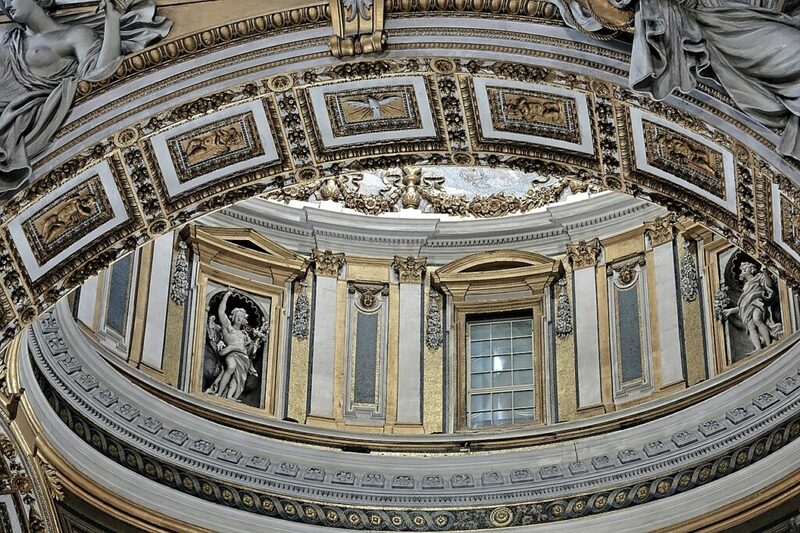 The basilica is the result of years of hard work from Bernini, Michelangelo, Raphael and Bramante. Michelangelo’s masterpiece Pieta lives here too – complete with carved sash proclaiming “Michaela[n]gelus Bonarotus Florentin[us] Facieba[t]” or “Michelangelo Buonarroti of Florence Made It”. If you’re not convinced that this is the world’s largest church, lines on the floor mark where all the other major churches would fit inside St. Peter’s. Often over-looked, the basilica of St. Mary Major is home to a miracle-working Virgin Mary image. This Virgin Mary was canonized and crowned in 1838 by Pope Gregory XVI. 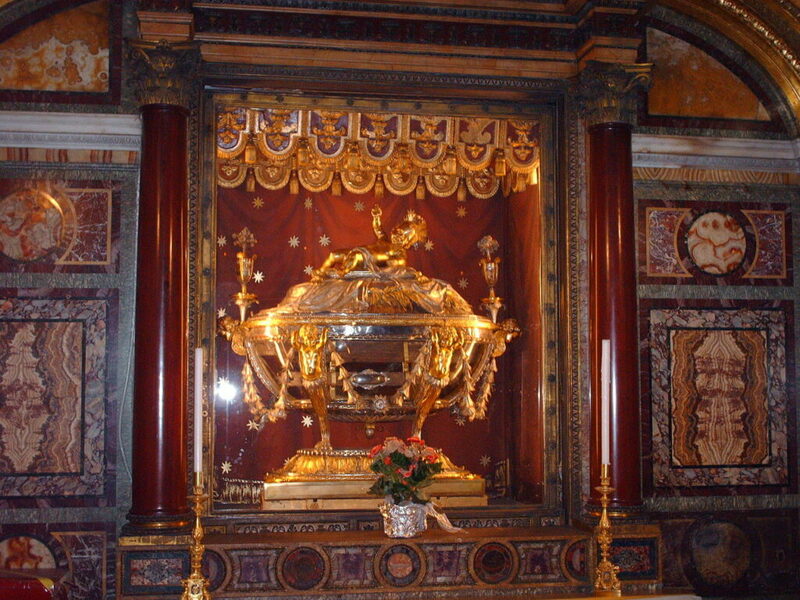 The basilica also has The Holy Crib, complete with it’s own gold reliquary. Built in 325 by Constantine’s mother St. Helena, this basilica was originally intended to house Christian relics. The relic chapel is still the most popular feature, which includes: part of one of the Holy Nails; three fragments of the True Cross; two thorns from the Crown of Thorns and part of the Elogium, the panel hung on the cross above Jesus’ head. 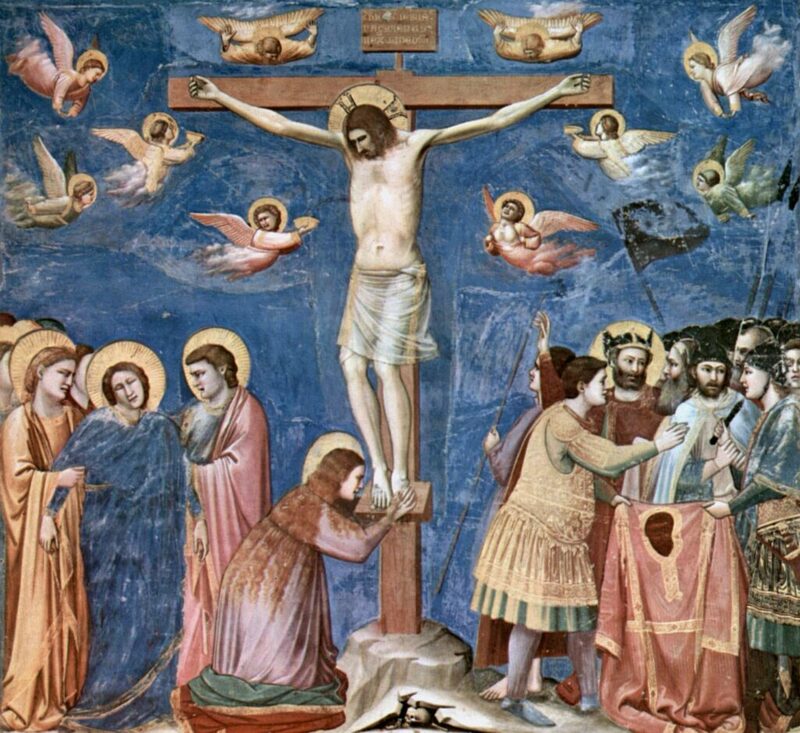 The Elogium reads, in Latin, Hebrew and Greek: “Jesus of Nazareth, King of the Jews” and is considered to be a medieval forgery. To give the basilica its full name: The Cathedral of the Most Holy Savior and of Saints John the Baptist and the Evangelist in the Lateran, this basilica was built under pope Melchiade (311-314) and is the most ancient church in the world. It’s also known as “Mother and head of all Churches on Earth” – which is much easier to remember. This basilica is the seat of the bishop of Rome, who of course, is also the Pope. For 11 centuries it was also the Popes’ residence, until they moved to Avignon, France. After they moved back to Rome, they lived in Vatican City. Now, the basilica holds the entombed remains of a few saints: Saints Cyprian, Secunda, Giustina and Rufina. As well as two popes: Pope Innocent IIIand Pope Leo XIII; who had the vision of Lucifer claiming that he could destroy God’s church in 100 years. As a result of this vision, Leo XIII composed the Prayer to St. Michael the Archangel. This Basilica also contains wood from the table used at the Last Supper. It is high above the altar above the Blessed Sacrament Chapel, to the left of the main Papal altar. Want to experience these intriguing, fascinating holy places in person? 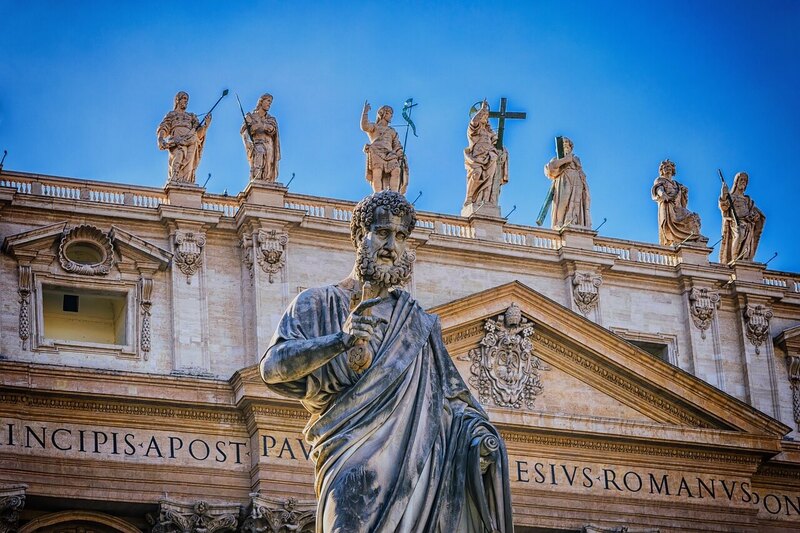 Check out this exclusive Basilicas of Rome tour to get a private tour of the must-see holy places in Rome. As much as we love Rome, sometimes you just want to escape the noise and heat of the Eternal City and step into a more laid-back pace of life! With something for everyone, here’s our pick of the top 5 day trips from Rome. With preserved ancient remains to rival Pompeii, Ostia Antica is a delightful excursion from Rome’s busy streets. Ostia Antica was ancient Rome’s vibrant sea port and is now an awe-inspiring archaeological showcase. Prepare to be immersed in the 2nd-century world of ancient Rome. You can visit the public baths – Terme di Nettuno – and admire the artistic effort put into the stunning floor mosaic onsite. After this, stop off at the awe-inspiring amphitheatre. 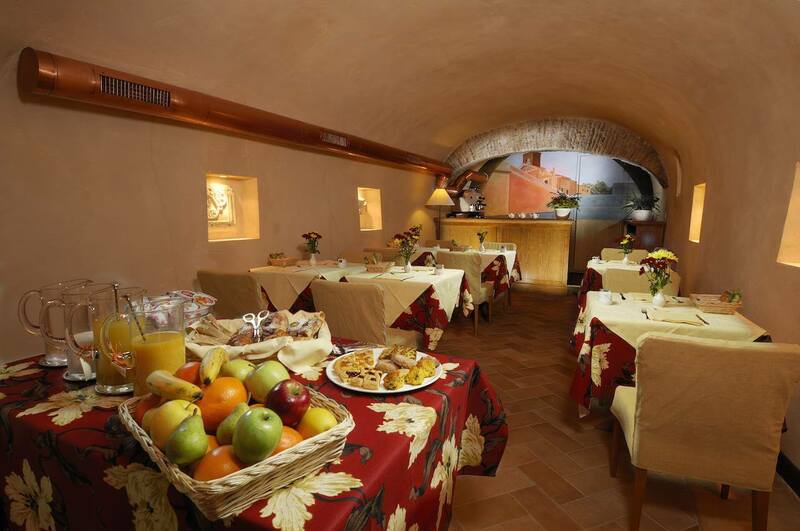 There’s also an ancient cafe – the Thermopolium – that still has traces of the frescoed menu on the walls. Want to know the secrets hidden amongst the ruins of Ostia Antica? Book into a private tour today. You can take in not one, but TWO World Heritage Sites on this day trip to Tivoli! Just 30km east of Rome, Tivoli is easily accessible by bus or car. Start your day out at Villa d’Este, a wonderful luxury villa and Renaissance gardens. Look out for the Bernini-designed Fountain of the Organ, which uses a concealed organ powered by water pressure to play beautiful music. There’s also the 130m-long Avenue of the Hundred Fountains to check out. After taking in all that splendor, head to Villa Adriana – the ruins of an expansive country estate once belonging to Emperor Hadrian. You’ll need at least an afternoon to discover all the treasures hidden over the Villa’s 40 acres. Hadrian’s personal refuge, Teatro Marittimo, was a mini-villa built on an island in an artificial pool, originally accessible only by swing bridges. There’s also the canopo (a landscaped canal overlooked by a nymphaeum – a shrine to the water nymph) several bath complexes, temples and barracks. Of course we couldn’t leave Pompeii off this list! Witness 2000 years of perfectly preserved history at the site of one of the most significant natural disasters of all time. This Unesco-listed site is huge and you’ll need at least three hours set aside just to see the essentials. Popular attractions include the Forum, Lupanare (an ancient brothel) and amphitheatre. Out of the town’s original 66 hectares, only 44 have been excavated, leaving plenty of new discoveries waiting to be uncovered. Enjoy the awe-inspiring beauty of an infamously picturesque part of Italy on our Pompeii and Amalfi Coast Private Tour. When in Rome, do as the Romans do. Many visitors to Rome experience a bit of culture shock – Italy isn’t like their favorite TV show portrayed it to be! If you want to avoid nasty hand gestures or awkward sniggering, avoid doing these five things on your trip to Rome. It might sound like a great opportunity to take a photo that will always remind you of your amazing stay in Italy’s capital, but beware the flashy fake gladiators at the front of the Colosseum! Despite their detailed costumes, they’re notorious for hassling tourists and being incredibly aggressive to get money out of visitors. Be wary of seemingly friendly ‘gladiators’ offering to take your photo for you – they have been known to demand money to return tourists’ cameras. Some even pose in unsuspecting tourists’ photos and demand payment afterwards. What they’re doing is illegal but it’s a difficult scam to stop, especially in the height of the summer season. Summers can be absolutely sweltering in Rome – especially standing in line for hours under the hot sun. There’s nothing like wandering through the cobblestone streets in something lightweight and breezy. But beware – there’s a strict dress code at all religious sites in Rome (and there’s a lot of them!). Visitors to churches, crypts and the Vatican should choose respectful, modest clothing for their visit. Keep shoulders and knees covered (this is for both men and women) or risk being refused entry. Generally museums around the world don’t allow flash photography inside their premises, due to the flashes damaging the priceless works of art on display. This rule is enforced within the Sistine Chapel above the normal level. Due to extensive (and pricey!) restoration work undertaken in the 80s, the Vatican sold exclusive photography and videography rights to a TV network in Japan. Despite the deal expiring many years ago, they’ve kept the ban on amateur photography. As to be expected, there are plenty of photos, books and souvenirs to browse through in the gift shop – so you can always pay a little bit extra for professional photography of Michelangelo’s masterpieces. 4. Don’t Order A Cappuccino After Breakfast and Don’t Even Think About A Vanilla Latte! Italians are notoriously passionate about their coffee. Forget ordering a Triple Venti Half Sweet Non-Fat Caramel Macchiato. In Italy, it’s believed that milk will interfere with the digestion of your main meals if enjoyed after breakfast. You’ll get away with ordering a cappuccino with your breakfast but after 11am, you’re going to get some funny looks for ordering anything milky. As for those special orders from your local coffee chain – forget it. Vanilla/hazelnut/flavored lattes aren’t on the menu in Italian coffee bars. Pro Tip: Most Italians drink coffee standing at the bar. If you want to sit down, it will cost 20-50% more to have waiter service. Don’t try to skip the fee by ordering at the bar and seating yourself – you’ll be met with an unhappy cafe owner! And there you have it! Avoid these common social faux pas on your visit to Rome and you should do well. To see Rome with a real local, book in with one of our professional tour guides and get a taste of the real Rome! Iconic, romantic and timeless, there’s so much to see in The Eternal City it’s hard to choose just one day’s worth of sights to see! Whether your visiting Rome for the history, the art, the food or the nightlife, you’ll be kept mesmerized and entertained. Visit the Vatican: You’ll need to start early to beat the crowds and it’s best to buy your tickets online in advance (queues are known to be in excess of two hours otherwise!). You can admire the Sistine Chapel, the Raphael Rooms and the Belvedere Courtyard. Spanish Steps: The Spanish Steps (yes, there’s 135 steps!) are a great place to take a seat, sample some local gelato and watch the world go by. 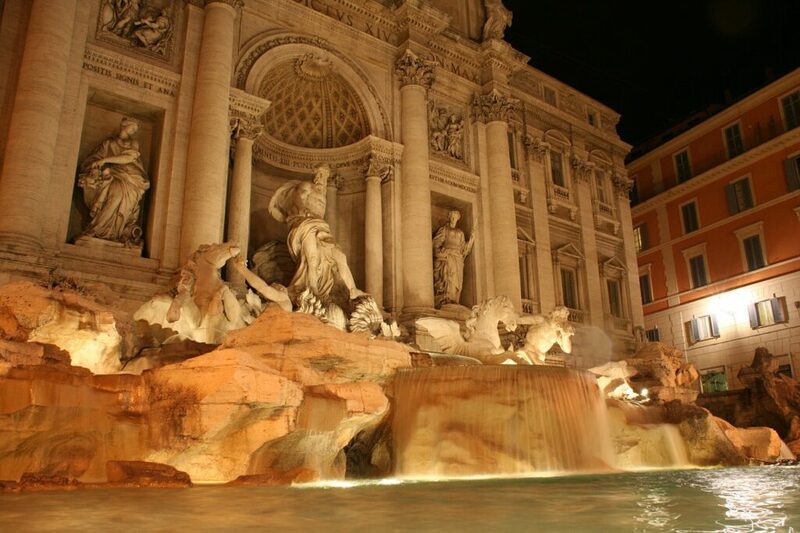 Trevi Fountain: Throw a coin in the iconic Trevi and legend has it that one day you’ll return to Rome. 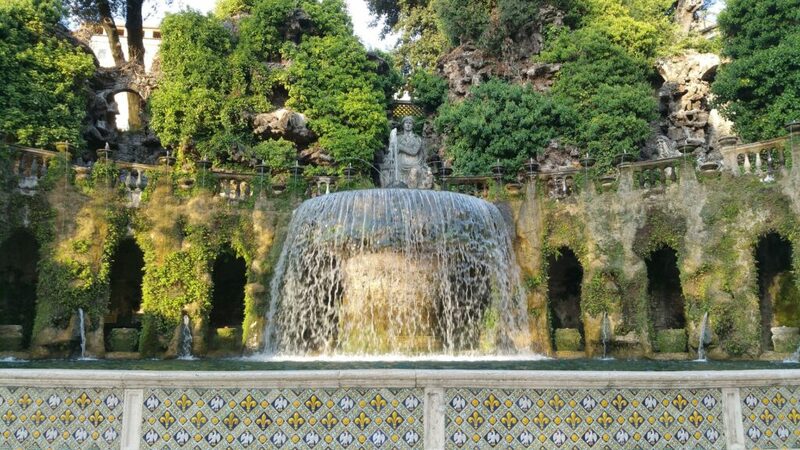 Featured in Fellini’s La Dolce Vita, the fountain was built in 1732 and shows Oceanus and his seahorses. The Pantheon: The Pantheon is the oldest-surviving temple from Imperial Rome, standing un-touched for over 18 centuries. Villa Borghese: Absolutely gorgeous, this sixteenth century villa now houses the world-famous gallery Borghese. Featuring works from Bernini, Caravaggio, Raphael, Canova and others. 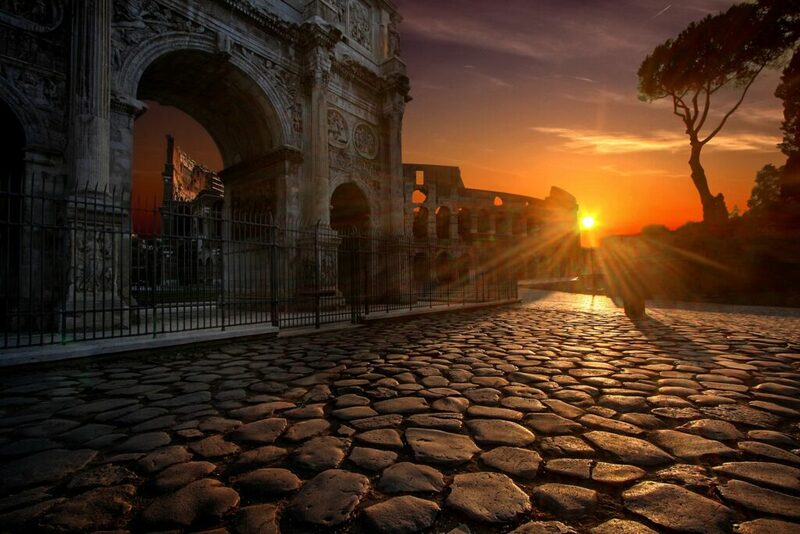 Roman Forum and Colosseum: Simply iconic. Trastevere: A picturesque medieval area, Trastevere is the 13th, and one of the oldest, districts of Rome. 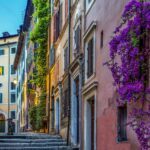 The heart of Trastevere is Piazza di Santa Maria, a pedestrianized square piazza lined with restaurants, bars, faded palazzi and the church of Santa Maria. Despite being in the center of Rome, it has a beautiful small village feel to it. The Jewish Ghetto: The ghetto of Rome was a Jewish ghetto established in 1555 in the Sant’Angelo district. 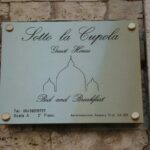 It’s a hidden pearl between the Tiber river and Venice Square and is a vital cultural reference point for the entire Jewish community. Basilica of The Holy Cross in Jerusalem (in the Esquilino quarter, not Jerusalem! ): Consecrated in 325, the original chapel on the site was built to house the relics of the Passion of Jesus Christ, which were brought to Rome from the Holy Land by Empress St. Helena, mother of Roman Emperor Constantine I. Originally, the chapel’s floor was covered with soil from Jerusalem, hence the name! 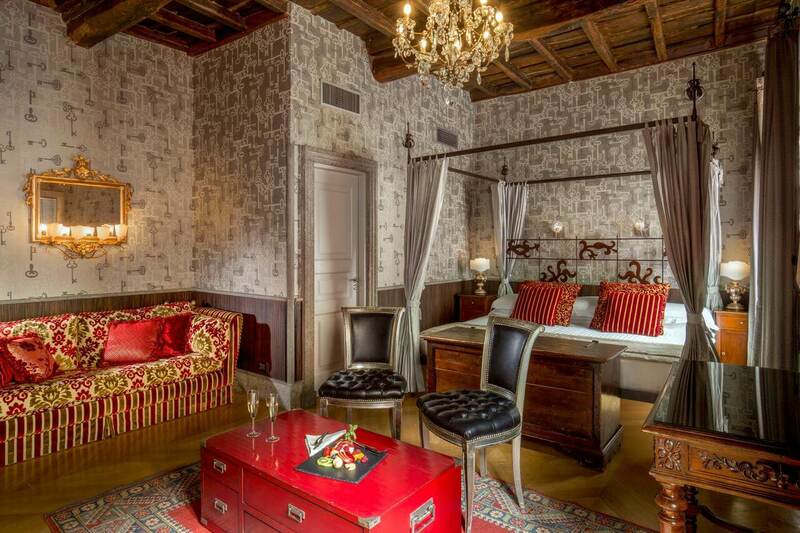 Case Romane: These houses contain more than four centuries of history. 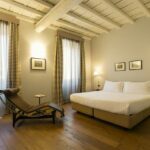 The frescoed rooms were originally shops but were transformed during the 3rd century AD into an elegant upper class residence. Within the rooms, you can admire some of the most beautiful frescoes of Late Antiquity. They say Rome wasn’t built in a day, but you sure can see a lot of it in one! If you’d like to pack as much in as possible and learn the fascinating history surrounding all these sights, consider booking in for our most popular tour: Rome In A Day Private Tour.